No 490 build at Folmer is undergoing the last finish at K&M. Together they show the difference between fast cruising ore pure cruising. Two years ago I designed a boatbike for Ebrahim Hemmatnia. Ebrahim nearly finished his Atlantic crossing from Dakar to Brazil when a shark gasped his rudder With 350 miles to go. The Brazilian marine has brought Ebrahim and his boatbike ashore Ebrahim will now bike across South America to Peru. Based on design No 366 I am working on a deckhouse version for a German couple. 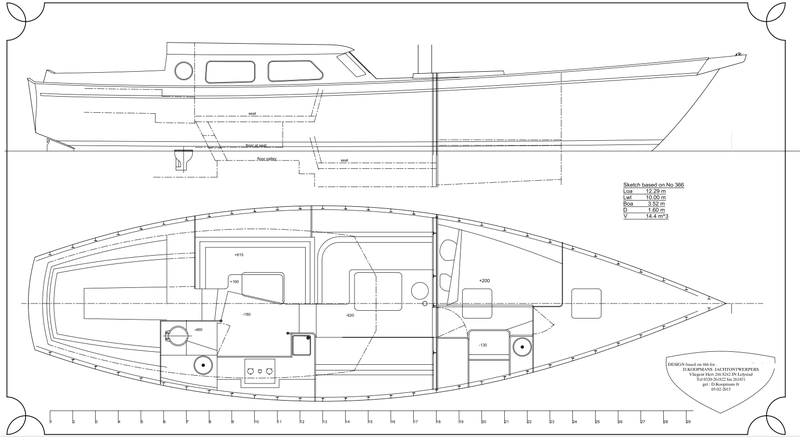 A version of this hull is currently nearly complete in Sneek and another one is under construction in Gdansk. Refit at Koopmans Kasko's on No 205 is nearly completed. The cockpit (original bare aluminium) is painted and the doghouse extends and not as wide as it was. She is ready for another 15 years without much maintenance. A new project in America. I hope to show more details in the next news.